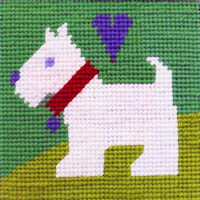 Unlike counted cross stitch, tapestry (or, more correctly, needlepoint) usually involves stitching onto a pre-printed canvas. 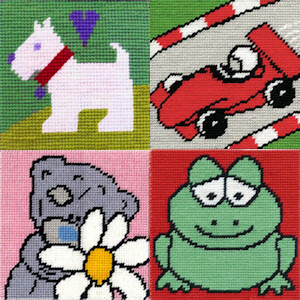 The design is already printed in full colour on the 10-count canvas, so that you can simply stitch in half cross stitch over each section of the design using the corresponding coloured thread. The thread used will be either wool/yarn or a thick cotton to cover the printed design effectively. 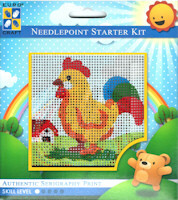 The starter tapestry kits featured here at Easy to Stitch offer the perfect introduction to this traditional craft for children and beginners of all ages. 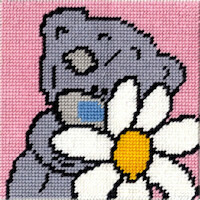 I hope you'll enjoy stitching them yourself or will use them to help others to learn this wonderful craft.